The issue of ejecting the USB flash drive usually comes when you click the “Safely Remove Hardware and Eject Media” icon or “Eject” option from right-click menu. Drive (letter) is currently in use. Save any open files on this disc, and then close the files or programs using the files before trying again. The device is currently in use. Close any programs or windows that might be using the device and then try again. Window is unable to stop the activity because the device is in use. Terminate the program and try again. The device working can’t be stopped right now, Please Try again later. Note: When facing with any of the above notifications, don’t force removing the physical USB flash drive. Otherwise, the data might be corrupted or lost. Or the file system of your device may get damaged. In case the data loss really happens, don’t be panic, please use iReparo Data Recovery to rescue the lost files or recover unsaved Word document. Most probably the write-up operation is not done completely and you attempt to close it forcefully. Files in the USB flash drive are in the use of another program, e.g. MS Office. Some real-time protection software, defenders, USB security disk are working on the drive. 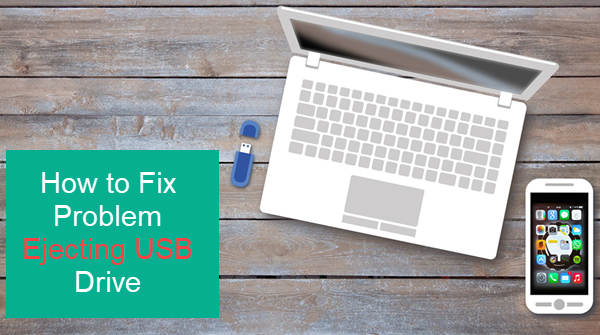 If you have double-checked all the documents and programs but the USB drive still refuses to be ejected, then please follow our given solution to safely remove USB. Note: Before the application of these methods, make sure you can recognize the device correctly. Take and note down the name, size, letter, etc., to remember that which device you want to remove. Along with it, you have to check that you have terminated all the file regarding that drive or not. Step 1. Click the Show hidden icons button on Taskbar, then right-click on Safely Remove Hardware and Eject Media icon. A menu will be shown that contains the list of all media connected with your computer. Step 2. Choose the device that you want to remove or eject. If your device is not present in the list, then you should go for the other methods discussed in this article. Step 3. Remove the USB flash from computer. You will receive a confirmation notification that your device is removed successfully. 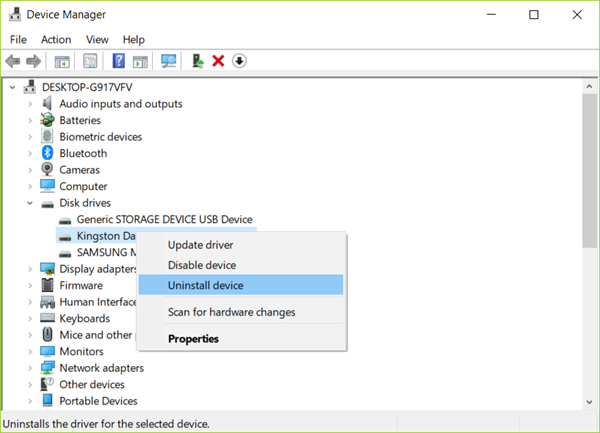 Windows Device Manager allows users to manage connected USB drives, like updating drivers, disabling a USB device or uninstall it. We can also utilize this feature to safely eject USB drive. Step 1. Right-click on This PC-> Manager-> Device manager from the left panel. Step 2. Expand Disk Drives. Here you will see a list of connected storage media. Step 3. Right click the drive you want to eject, then choose Uninstall device and click OK button to confirm the uninstallation. But don’t ever click on the delete the driver software of the particular device. When you select the delete option then it will permanently delete the device driver folder from the driver store. Step 4. After you have done the uninstallation process, remove the USB drive from the PC. Don’t worry. Your Windows PC will automatically install and recognize the USB drive next time. Disk Management is another useful utility of Windows PC. It is for managing local disk, external hard drive and removable disk (including USB drive and memory card). The following USB safe removal process is based on Windows 10 OS, but you can also find Disk Management in Windows 7/8 easily. Step 1. 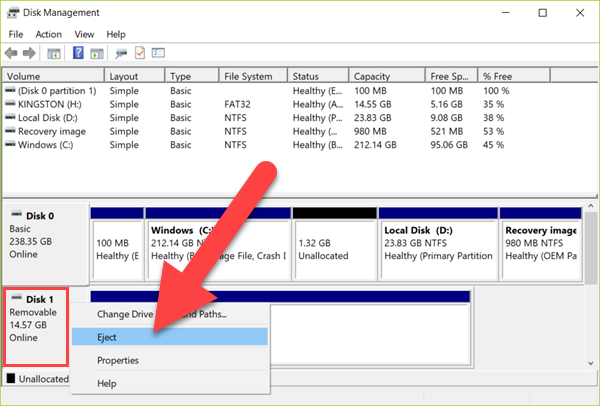 Press Windows key + X key at the same time, choose Disk Management from the list. Step 2. 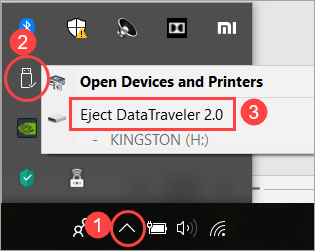 Find the drive that you want to eject safely, then right-click on the left area and choose Eject. Note: If you want to remove the flash drive you will see an Eject option. But in case of external hard disk, you will see the option of Offline instead of Eject. Select the option of offline and then remove the hard disk. When you re-attached this hard disk to your computer then you have to change the setting to Online by repeating the same process. The above are alternative methods for fixing problem ejecting USB mass storage device problem. As long as you check carefully for unsaved files or unclosed programs before applying these solutions, your data and the USB drive should be safe and sound. Share your questions or tips with us in the comment area!